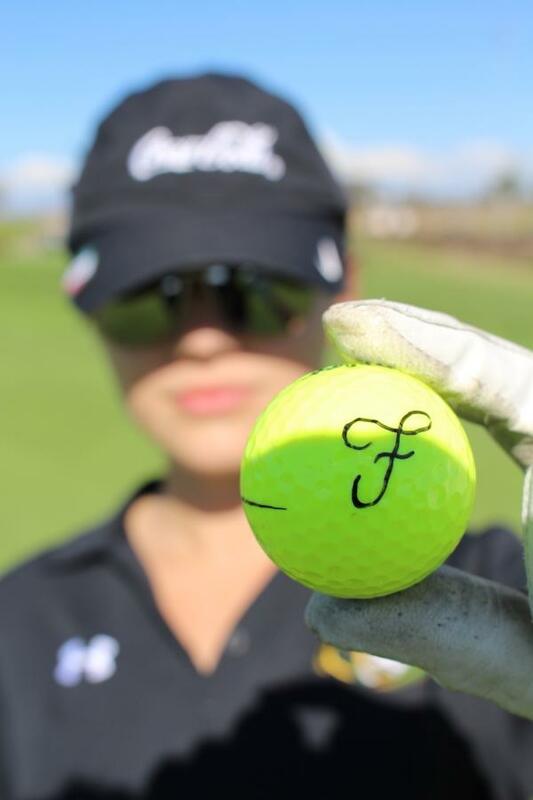 Fabi Sanchez holding up a golf ball with her first initial written on it. Fabi Sanchez tees off our first sports feature story that will surely warm your heart. Sanchez is a senior at Sage Creek who owns the title of senior class president. She works hard to become an active student and one that people will remember. She does so through her focus in the classroom and her focus on the course. Her training goes way back to her first putt-putt course. Getting out on a real golf course was not what such a great golfer’s backstory would sound like. Most parents get their kids into sports like soccer or t-ball when they are young. But for Sanchez, her dad started her with golf. Golf was new for both Sanchez as well as her father. “Golf never ran in the family [but]…it was something he got hooked on and shared with me” Sanchez said. Her dad taught her everything she knew. Besides one lesson in the summer, Sanchez only had her father to rely on as a coach. Being a coach means teaching beyond the fundamentals. As a father, there was no better way to teach young Sanchez life lessons than through golf. Over time and shared wisdom, Sanchez was taught how to love the game. “I’m not going to lie, I did not enjoy it. I liked it because it was time to spend with my dad” Sanchez said. Her bond with her father transferred quite smoothly to her strong bond with the girls on the varsity golf team. They grew throughout the four years of high school, closer and closer. Creating friendships that will last a lifetime. Sanchez’s background as a golfer has truly shaped her to be the individual she is today and will be tomorrow. “[Golf] is so strong it brings us all together,” Sanchez said. Great job with the story, Drake. And I love learning more about Fabi! Drake…mah boy. Nice article! I look forward to more of your intriguing posts. Great article Drake. I look forward to seeing more from you.